Stephen Colbert interviews Madeleine Bordallo of THE FIGHTIN’ GUAM! Stephen Colbert’s 435 — excuse me — 434-part series, “Better Know a District,” which has been expanded to the four-part “Better Know a Protectorate,” had what may be its funniest entry yet, where Colbert interviewed Guam Congresswoman Madeleine Bordallo on Thursday’s episode. 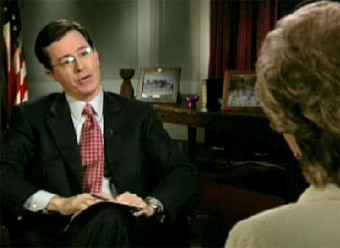 Usually, the subjects of Colbert’s interviews have an idea of what they’re getting into. Some play along with the joke better than others, but most of them know it is a joke. Based on her bewilderment, however, Bordallo apparently did not. The results are hilarious. What I like about Colbert’s “Better Know a District” series is that the joke isn’t mean-spirited. He will mess with his subjects, no doubt about it — but there’s a friendliness to it. You might even call it truthiness. This was the case even with Bordallo. Watch the video at Colbert Nation.